← 12 Hours to Go! Complete half marathon – tick! Question: What do you get at the Miura International half-marathon as your special gift? There could be a number of answers to this question. A bad case of chafe. Blisters. Very sore legs. All of these are possibilities but are in the end, wrong. The answer is an enormous radish. 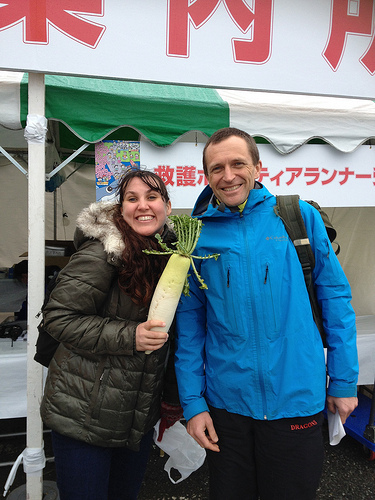 Me, Simon and an enormous radish – otherwise known as daikon. Thanks to @LorimerSimon for being a great running mentor, race organiser and supporter on the day. Also thanks to everyone who ran with me, gave advice, cheered me on etc. You know who you are. And finally, thanks to Elaine who called me on the telephone to congratulate me on the race, 500 m before I had reached the finish line. Your timing as always was impeccable but somehow those last few metres were much easier after having talked to you! Can’t believe you would answer the phone whilst running or leave your shoes behind. Haha, wait yes I can. I will never do a full marathon. I’m too old to start training for that kind of thing now!! Woohoo Merilyn!!!! You did it!!! Congrats!! !